You might have seen him on the streets of Sofia lately: red-haired, cool dude, with an acoustic guitar in his hands, and a strong voice. He travels, plays and sings for his own pleasure (it seems). 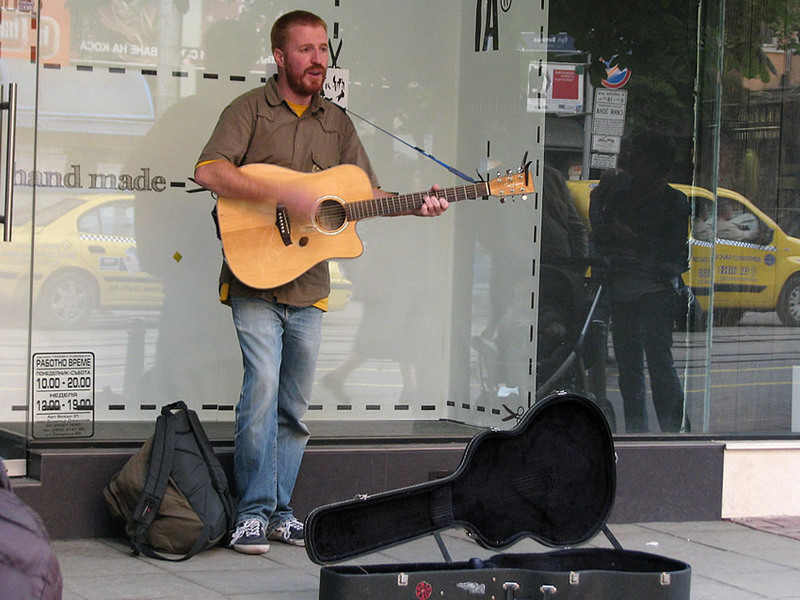 He’s now in Bulgaria and you can go and listen to his music in the Sofia music clubs — but sometimes on the street, too. …then, after his last song, I asked him, where’s he from. Once we knew Jamie is from Ireland, it was quite obvious we’ll ask him to sing us some Irish song, since we’re big fans of Irish music! Jamie Mc Donald has an official Facebook page and a YouTube channel. you can listen to a few tracks from his next album, The Way It Was (where he performs with Boyana Zhelyazkova, violin). I like the music, a lot! In the next few weeks you’ll be able to hear him sing in one of the Sofia clubs (maybe Mc Carthy’s or Swingin’ Hall)… or again, on the street.